This scale has Easy-to-read notched and tiered beams, self-aligning beam design, magnetic dampening to minimize oscillation with speed weighing with zero adjust compensator. 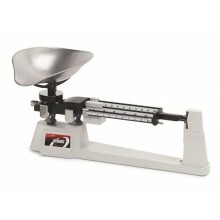 The CHATILLON® WT12 Series mechanical dynamometer may be used as a weighing tensiometer or crane scale. This precision weighing instrument features a large 12-inch (305 mm) dial face with shatter-resistant dial cover in a strong aluminum housing. Available with pound or kilogram dial face, the WT12 Series accuracy is better than 0.5% of full scale. A manually engaged clutch “freezes” the pointer at is maximum reading for exact reading of peak weight. Needle bearings in shackles prevent brinneling under heavy loads and eliminate shackle misalignment. Mechanism sealed against dust and dirt. Oiling not required. Dynamometer comes with NIST traceable Certificate of Calibration with Data. The CHATILLON TD5 Series mechanical dynamometer may be used as a weighing tensiometer or crane scale. This precision weighing instrument features an easy-to-read 5-inch (127 mm) dial face with shatter-resistant dial cover in a strong aluminum housing. Available with pound or kilogram dial face, the TD5 Series accuracy is better than 1% of full scale. A manually engaged clutch “freezes” the pointer at is maximum reading for exact reading of peak weight. Needle bearings in shackles prevent brinneling under heavy loads and eliminate shackle misalignment. Mechanism sealed against dust and dirt. Oiling not required. Dynamometer is supplied with a Certificate of Calibration with Data traceable to NIST. Accurate and dependable, the original OHAUS Triple Beam balance has been the standard in science class rooms for decades. Whether you’re weighing solids, liquids, powders or even animals, an OHAUS Triple Beam balance is well equipped to handle the job. 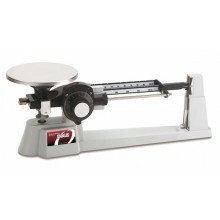 These balances offer the accuracy and convenience ofa top-loading balance while allowing students to gain hands-on experience through manipulation of the poises and attachment weights (sold separately), as well as to visualize mass measurement principles.